After designing the original website for Maxvite, Bitochon subsequently was selected to redesign the site. 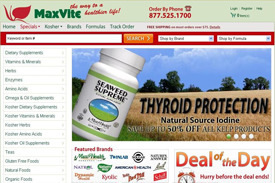 Located in Brooklyn, New York, Maxvite sells premium brand kosher vitamins, vitamin supplements, minerals, herbs, amino acids, fish oils, teas and skin care products at discount prices. The New York web design by Bitochon is an Ecommerce website that enables customers nationwide to browse, shop and make purchases online using a credit card. Products are arranged in categories such as kosher vitamins, organic & natural products, vitamins & supplements, and organic & natural foods. The site also includes an FAQ, testimonials, shipping information and a blog. It even allows users to contact a nutritionist via e-mail for advice about vitamins and supplements. By establishing an account, users can store previous orders and facilitate fast checkout. The site features an easy-to-use administration interface so that revisions can be made to content as needed.